Current N0R radar loop above from Wunderground with subbasins overlay. Beginning Oct 1, 2017 the N0Q and PTA Nexrad producuts have been dicontinued and replaced with the A2M multi-radar multi-sensor rainfall rate product by the NSSL(?). Because only the 2 distant airports have heated precip gages and N0Q over shoots the winter precip, I will compare the UNADJUSTED A2M to the Wundergages until snow starts. So if it says N0Q I mean A2M. 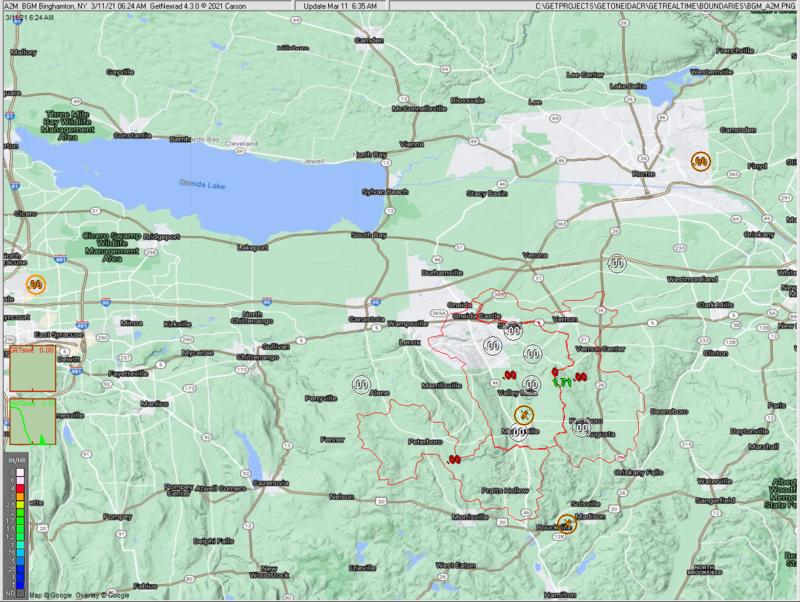 Below is my GetNexrad zoomed N0Q radar area 56 miles north of the BGM radar, Wundergages (white), adjusted N0Q radar rain (red) at watersheds over the Oneida Creek 3 sub-basins. 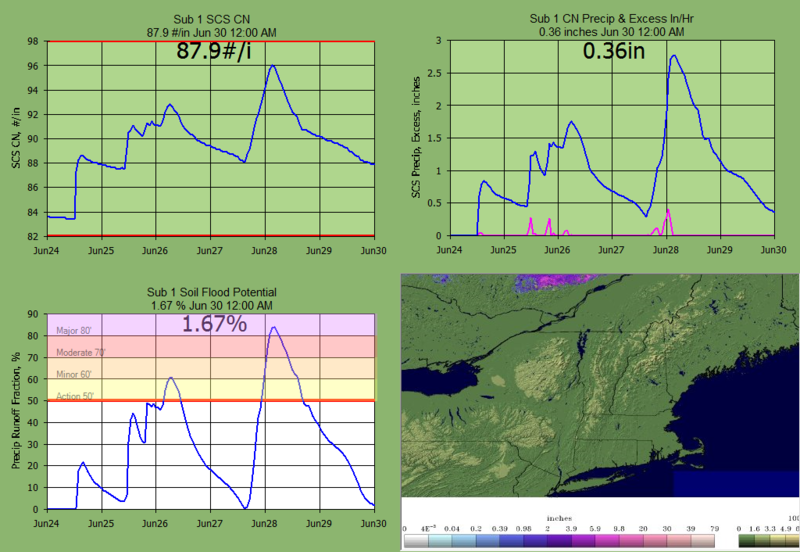 Displayed values are for rain gages and adjusted radar for yesterday through time shown (no forecast nor snowmelt). 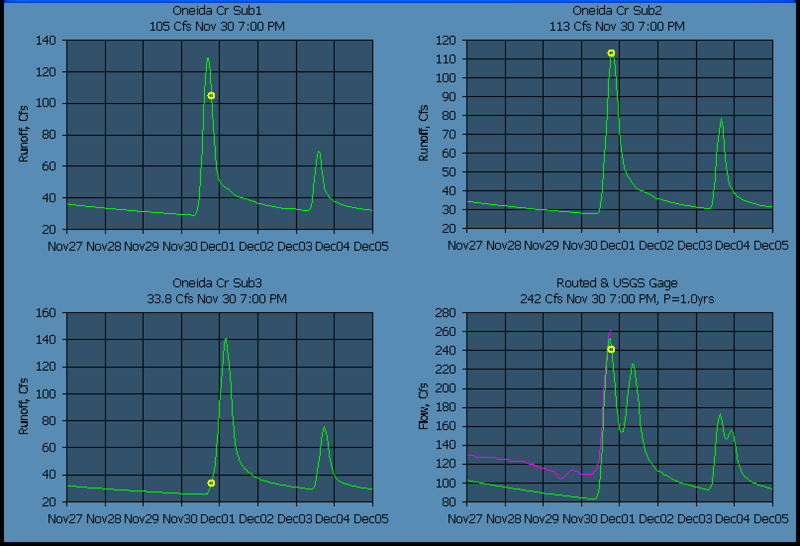 5-minute radar N0Q cells are 0.57 x 0.70 miles (1km x 0.5 dBZ). The 5-min radar is adjusted hourly with the Gage/Radar ratio. The heated rain gages at the Syacuse and Rome Airports are used when the closer Wundergages are frozen. When snowing and not raining, a daily or 2-hour G/R ratio instead of hourly may be used. Latest changes to setups are posted in the Rouge's Gallery of Snowmelts section below. Yesterday and Today's Rainfall with Unadjusted A2M Radar. White circles ON gages, Black cirles OFF, Red values subbasin unadjusted A2M precip. 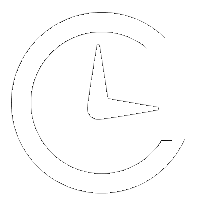 Three hour Nowcasts are being evaluated on my web page here. Last Forecast (thick olive green) is the last forecast ran for the previous day. Values shown as % are mean absolute error when either value > 0.05 inches as Sum G*|G-R| / Sum G*G.
Hourly Adjusted Radar at the ABC Dairy Wundergage. Note 20% MAE for adjusted hourlys is par for the course. 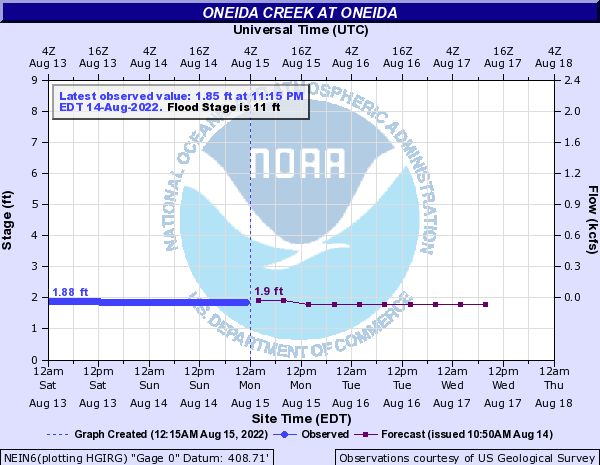 The reason adjusted hourly MAE is important is for runoff. Runoff don't care about the NWS slick willy's bias for dailys above. But for winter snowpack accumulations, slick willy's bias will do just fine. Ooops, maybe not here where the snowpack melts every other day. Months 3 & 4 using HARD SET RADAR RATIO ADJUST= 1.0 after Nov 12 freeze when snowing. No heated Wundergage yet: Melt runoff calc losses will be reduced 15% by GetRealtime when snow present to account for frozen soil. Months Dec and Jan and Feb: Heated rain gages are being used at the Syracuse and Rome Airports. Different unit graphs are under investigation for snowmelt but the Curve Number losses seem fine. Months Mar and Apr: Back to summer unit graph, convective radar z-r.
For this basin (swamp storage) I decided to use the GW return for long duration base flows instead of quick reponce interflows that I have a bad habit abusing. The SCS CN soil return flow is easy to usually get with silt loam B 0.17 return factor for the entire basin and matched the semilog recession slopes of the USGS gage. To make things easy start with the lowest flow of last year for a base flow. Then set the Soil Loss Factor for a first fit and jiggle the GW loss and speed factors to hit the dry period around Oct 1-20. I used a dimensionless unit graph for a like sized basin in Alabama where I had removed the return flows and adjusted the dimensionless graph fit so interflow was in my construction. Most off the shelf dimensionless graphs like the SCS do not seem to want to include interflow recessions so you end up using lower CN to get the peak but an evan lower recession (but always start with SCS to get your bearings). 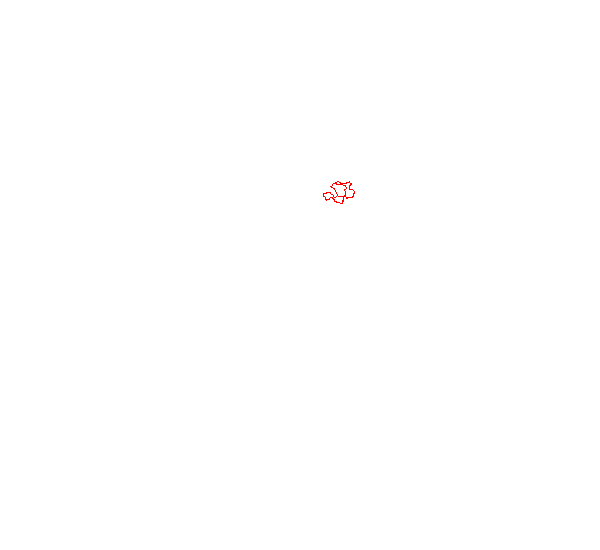 And there is always the 3-triangular unit graphs when nothing will fit except making another dgf. I never actually look at this type graph but it is instructive to see what GetRealtime calcs are doing (see Runoff Wizard Write Runoff text). 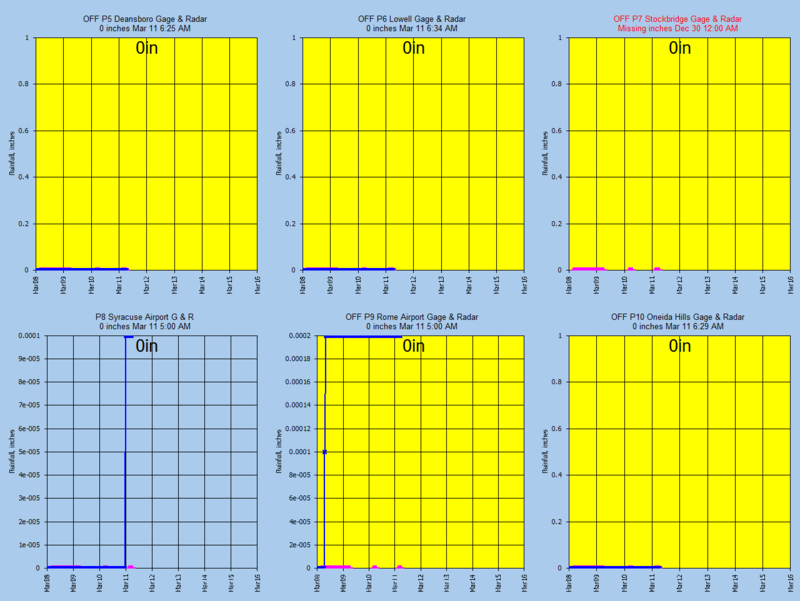 Nov 23, 2014: The long wave radiation could be adjusted to set the timing of the melt and peak for this date. 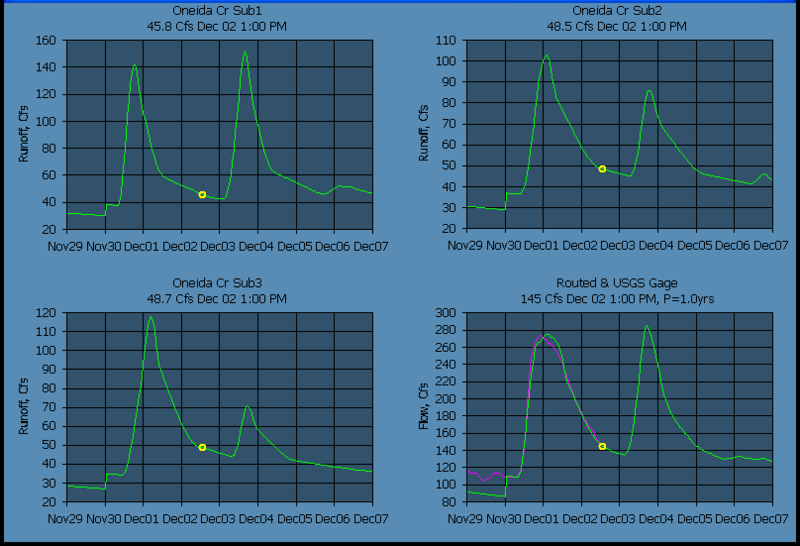 I finally decided to use the long wave adust=1 which matched the timing perfectly but the peak was way high. The snowmelt factors used are: 0, 1, 0.75, 1, 1, 1, 1, 34 where 0.75 is wind. If my computed long wave radiation had just dropped soon enough then this peak might have been avoided. 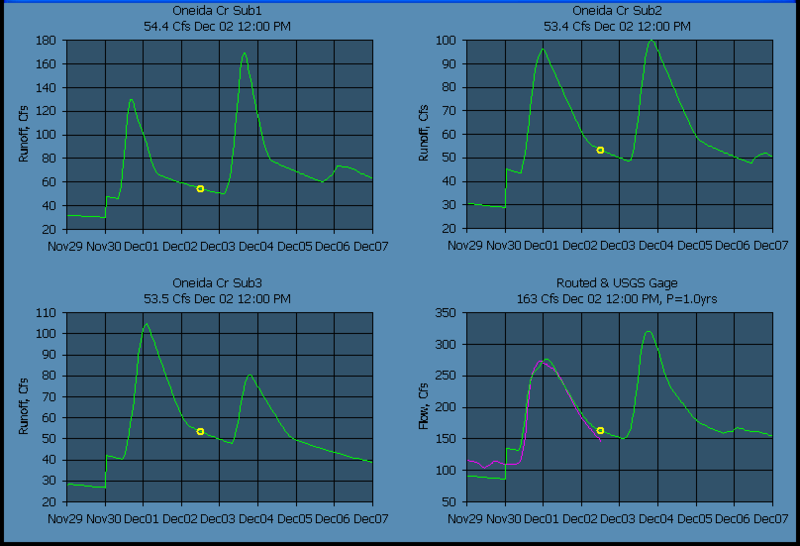 Solar radiation adjustment had little affect on the timing or peak. Nov 23, 2014 Update: After further review of the above snowmelt I changed the Temp adjust and a Long Wave factor for Sub 3 as below. 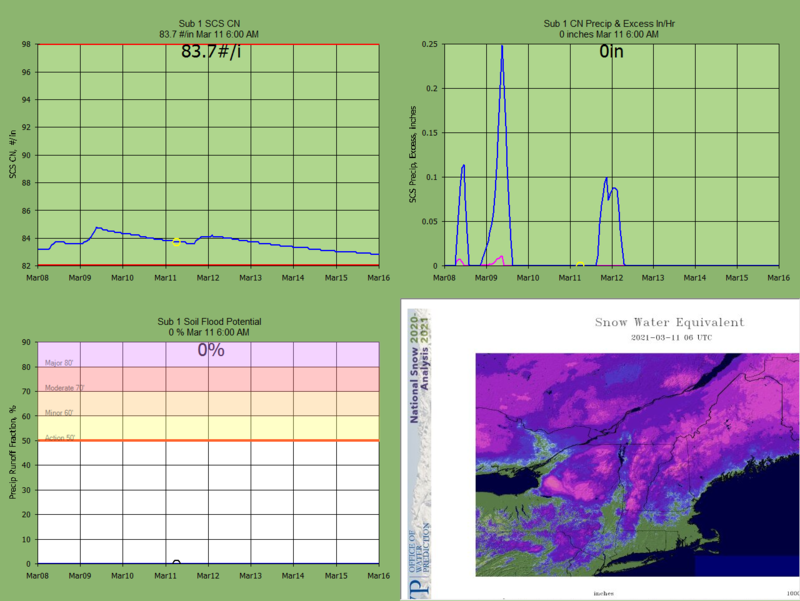 Snowmelt in Green, USGS in pink. The blues show Sub3 melt moved. 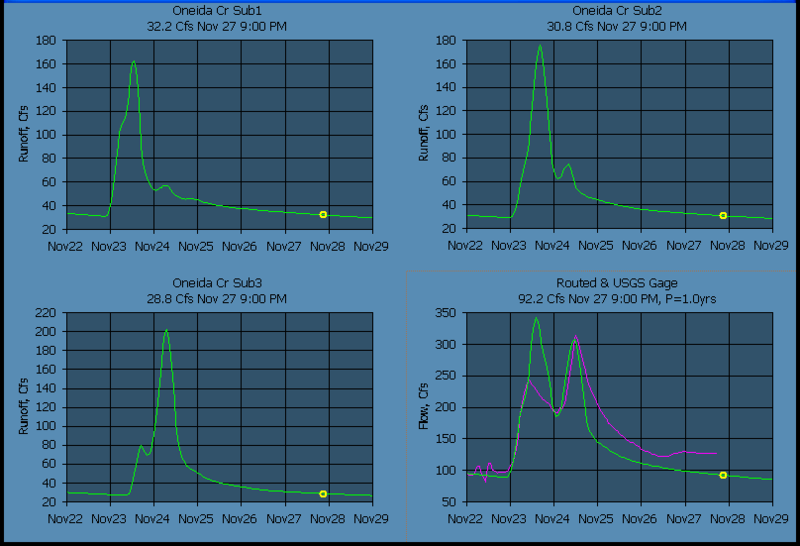 Nov 30, 2014: Here is the state of the 3 Sub's hydrographs as the USGS gage is peaking in real-time with the current snowmelt factors above. 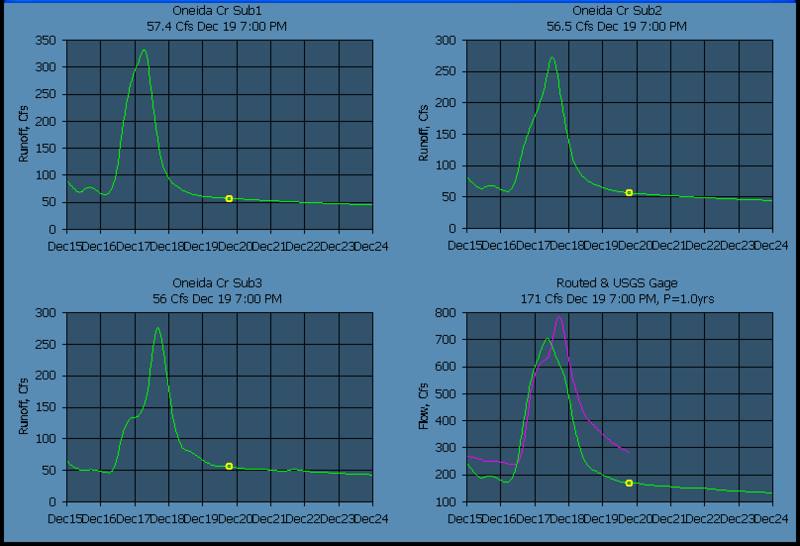 The yellow circle was the current real-time. Sub 1 has peaked, Sub 2 is peaking and Sub 3 is just starting to melt. 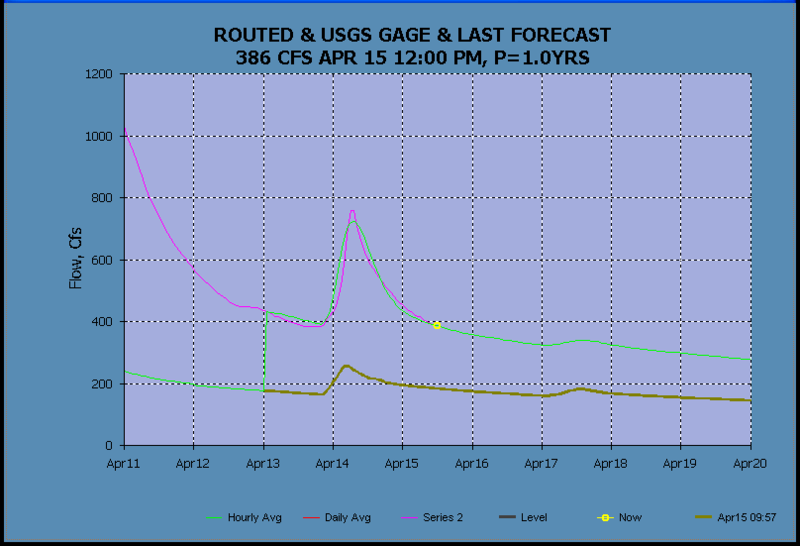 The USGS gage is near it's peak... I hope. I looked at last years USGS flows to see if this double peaking was normal but most winter flows are ice affected and not published. If I paid for this gage I would tell the USGS to give it a better shot than sorry no can do, it's so cold. I knew they didn't pay their winter field man enough. So this is probably about the last shot at this stuff for this year. I guess we will have to supply the winter flows for them. Nov 30 update: After some trials at everythig, I decided to put the blame on soil losses, although raising the constant radar rainfall adjustment from 1.0 to 1.35 woud also work. This is my first real winter snowmelt with a real working USGS gage so all of this is conjecture and undoubtedly will be rethought. 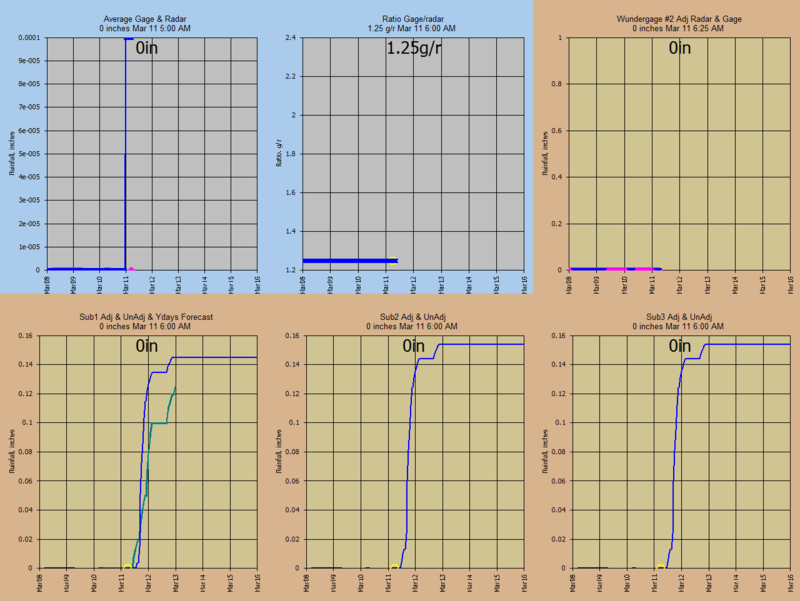 I had to go to tri-liear reservoirs to shape the hydrograph to account for very bad snowmelt??? But it worked for this event. What the next event says may undo all my thinking. The soil loss factors for the subs went from 0.85 to 0.485 but may had to account for a USGS gage shifting and I kind of doubt the high recession flows will hold. 0.5 would have worked as well but I'm using the 85 to remember where summer losses are. As you can see, tell me what you want and ya got it... for at least one event. Nov 30 update2: As I figured, the USGS continues the steep runoff recession while my subs have already gone to the high flatter soil returns caused by increaseing the soil returns. 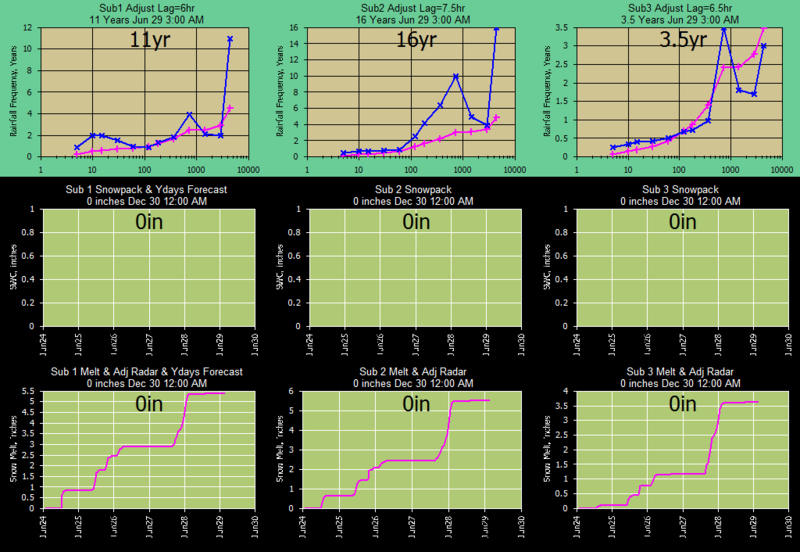 It's a shame it's starting to rain/snow again right at the phase 34F point so the recession may be short lived. But I think I've seen enough to go back to the 0.85 soil loss factor and raise the Gage/Radar constant ratio to 1.35. Ten wundergages and not one heated, grrr!!! Although for the Nov 26-Dec 1 snowpack build/melt the Bartlett Gage had sporatic morning gage melt amounts totaling 0.46" to the radar's 0.32 so G/R=1.44. That's just what the doctor ordered! 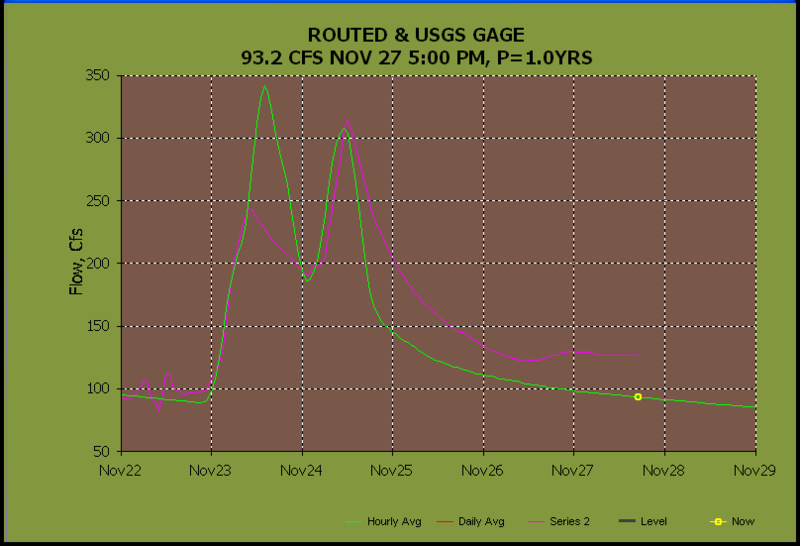 I also rasided the Base Flow for each sub from 8 cfs to 15 cfs which I hope is due to a shifing USGS gage. 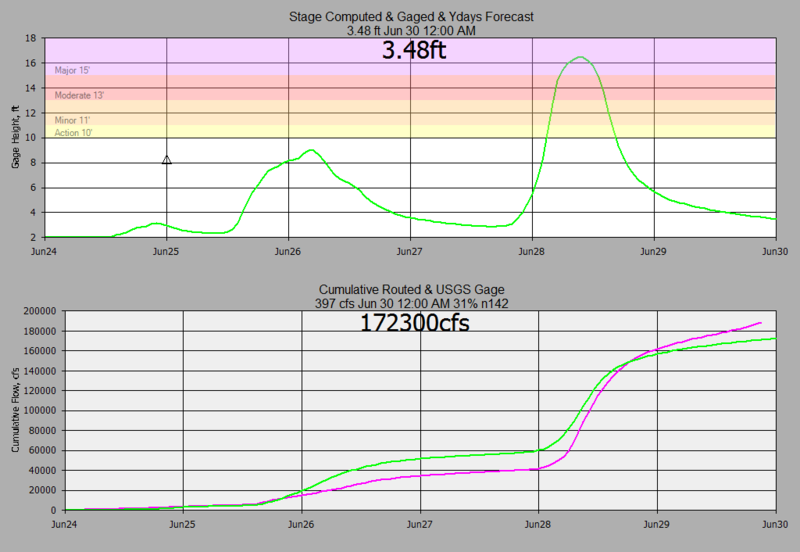 And now note below how the ending base flows are about 130 cfs instead of 160 cfs. Dec 6 update: There was no melt at all to compare with the 700 cfs USGS peak. So I added a +3 F shift to the base temperature reported by the Wundergage. Hopefully if any adjustment to the melt is needed it will be just this one factor to reset. The snowmelt factors where set to these. Dec 9 update: The Forecast of basin Temperature has been shifted +2F higher (P1+2). Three Wundergages are being averaged for Temp, Hudiity, and Windspeed with the Basin Avg Temp shifted +2F higher. The Wundergage at the lowest elevation was down so that the +2F temperature shift may be a bit low. The Rome airport heated rain gage seemed to be frozen for a while so the Syracuse airport gage was used with a 2-hour G/R ratio because of its distance from the basin. Base flow riparian factors reduced from 0.3 to 0.0. This will remove the rising winter base flows and increase the summer flows that is useful for arid streams. 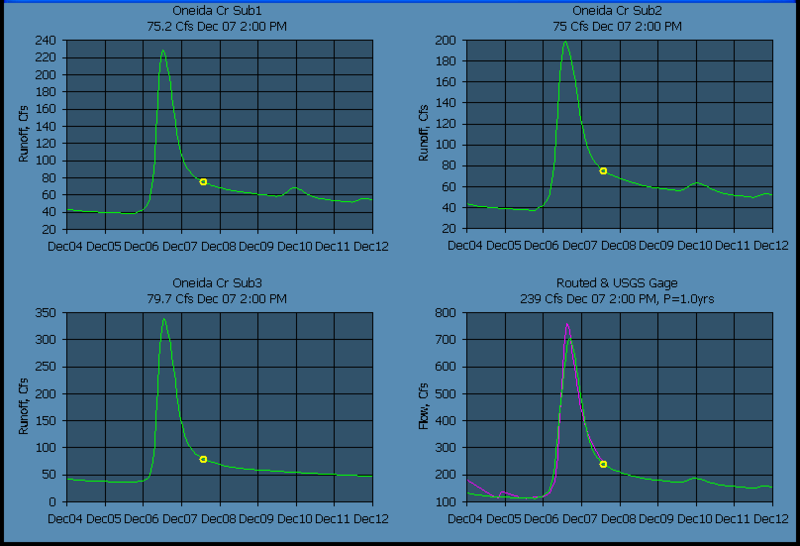 Dec 15 update: The USGS made a flow measurement and raised the flow so I put back in the base flow riparian factor at 0.3. The model melt was way too soon with +2F temperature adjustment. I will lower to +1F and will never change it again!!! I think the flaw in my long wave radiation is that 95% Humidity doesn't gaurentee a cloudy sky with more heat in New York so my long wave is the weak link in my flux capacitor here. It only works in the movies. Update Dec 16: I lied and have lowered the temp adjust to -1F for history and redid starting Dec 12 to match the current snow on the web cams (ok, it so happens to match the USGS flows but that would be cheating!). Update Dec 17: I need to go to a -2.5F adjust ...grrrrr!!!! 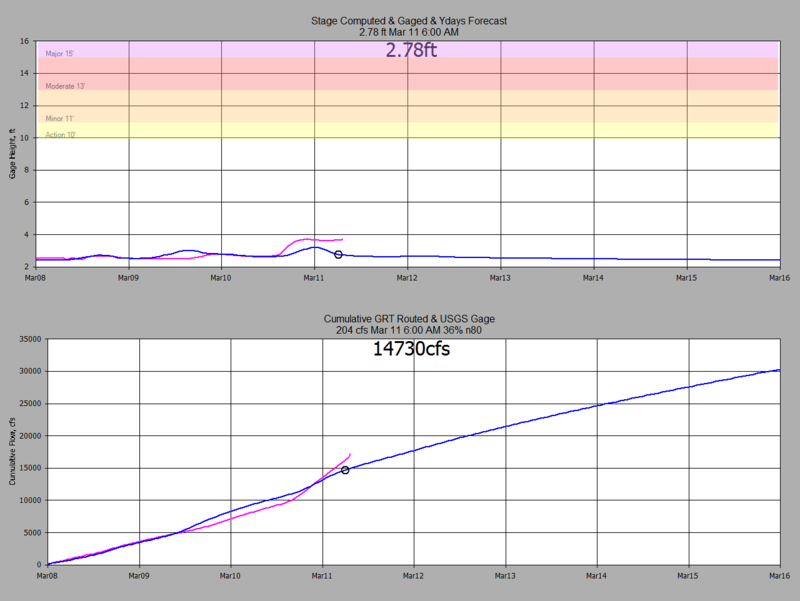 Dec 17 peak update: Steady as she goes with the Dec 12 settings. Let her ride for now. 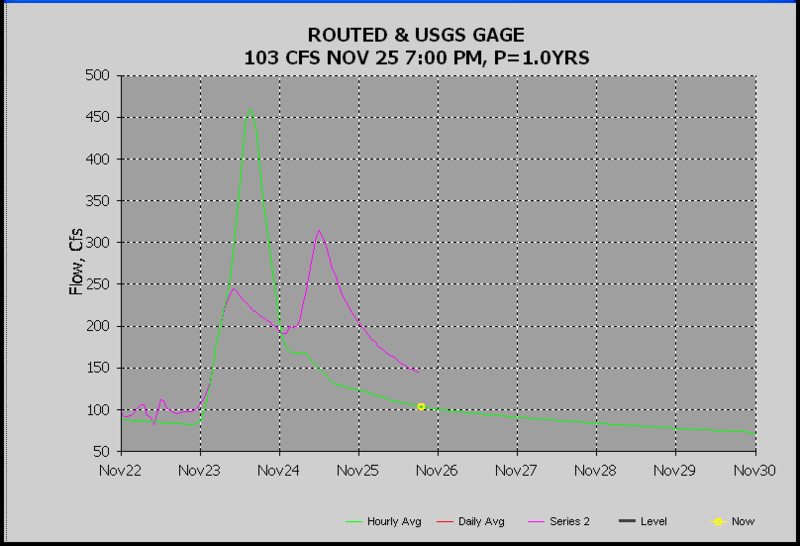 Dec 24 Peak--As the USGS gage was zooming off the graph I figured all the snow on the web cams was indeed snow. I went back to Dec 9 and used a default radar adjust factor of 1.5 with a 2 hour adjust of 0.04 trigger. Viola! Case solved. I reduded the default adjust factor to 1.25 on Dec 22 and remains at this. Radar is a very peculiar thing that takes some judgement, and good judgement comes with experience, and experience, well as Cousin Woodman says, that comes from bad judgement. My SCS loss method is pretty much a done deal from the summer, so when the cumulative flow volumes aint adding up, we probably have the wrong radar rainfall. And in general, I don't like how far the heated airports are and am even a little dubious of the Syracuse rain gage but what can you expect from flyboys. ;-) I have seen 3 USGS rain gages and a Wundergage all with in 5 miles of each other and in this perfect world they all march in step relative to the radar to where an adjustment from anyone of them would suffice. So when looking at rain gages to adjust the radar, the good ones will be the same relative to the radar which leaves Syracuse the odd man out. But low strataforms are a horse of another color based on radar site distance. So adjusting 50 mile subs with 70 mile gages in winter is just asking for trouble and probably summer too. One can adjust 100 mile subs but only with 100 mile gages and not 50, nor 70 no how. 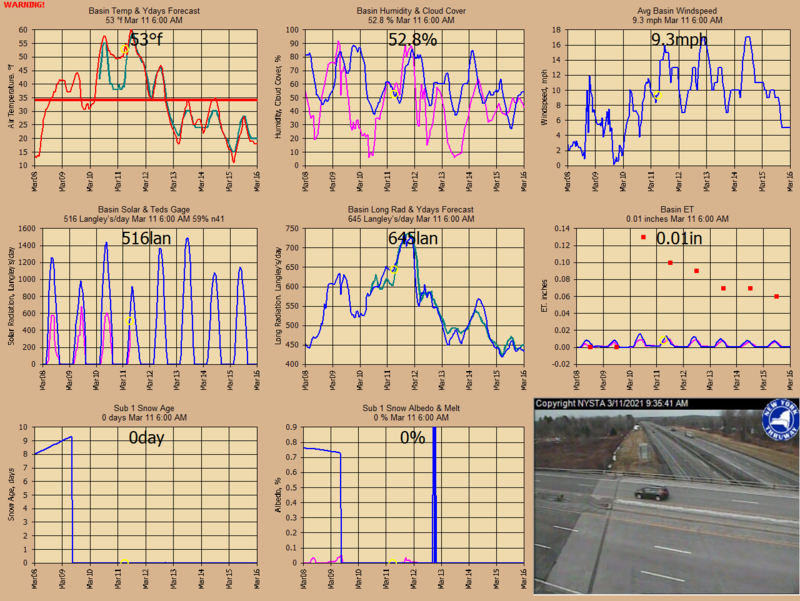 Mar 11 Snowmelt Peak--As fate would have it, all 3 gages averaged to be used in the snowmelt computations were down on the peaking Mar 11...P1 ABC Dairy, P3 White Eagle, and P5 Deansboro. So when this happens, GetRealtime uses the previous days hourly values for the missing for better or worse, which was a very warm day. I need to track down why the Forecast for the snowmelt values where deleted when there is missing gage data which would be a better estimate of conditions. 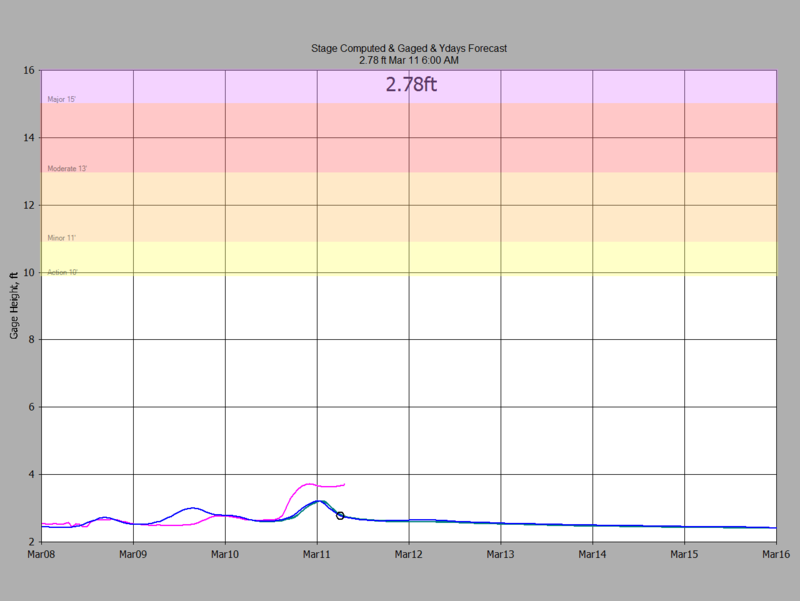 The GH record did not collaborate the high peak runoff for Mar 11. I have replaced ABC Dairy, White Eagle and Deansboro with Ted's Farm, Smithfield, and Fountain Street temperatures which means all my fine tuning of temperature is out the window. Apr 13, 2015 End of Snowmelt--So what can go wrong does with the temperature gages. 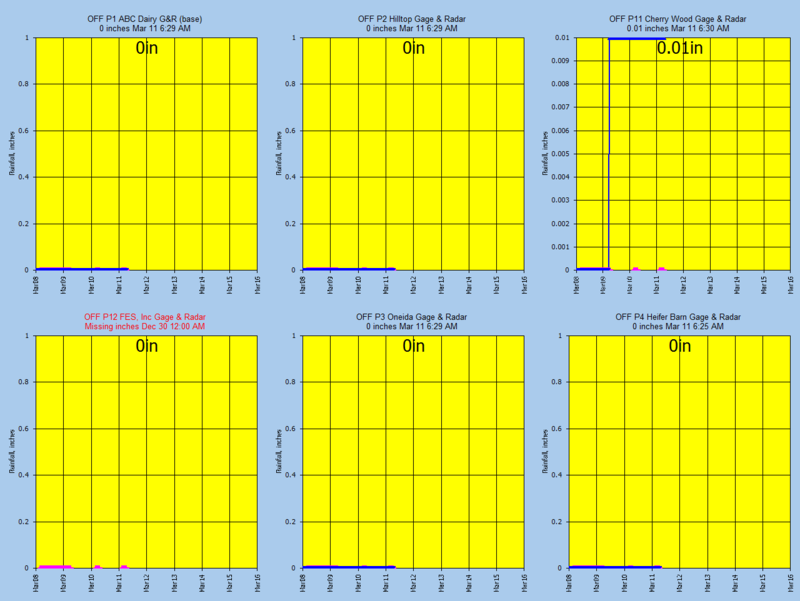 The USGS began providing streamflow again on March 26 and my melts were way low due to the early model melt. Seeing the need for a way to easily bring soil moisture and ground water return back on track, I updated GetRealtime to do this for all subs at one time. The user provides an amount of +-rain to be added to the soil and groundwater based on the setup fractions to mimic infltration or reverse infiltration. 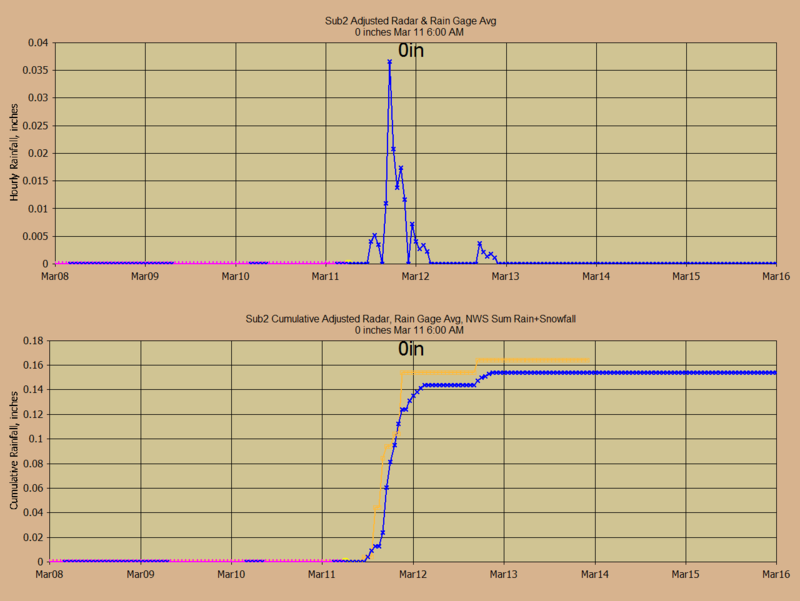 On Apr 13 I added 1.7" of infiltration that saturated the soils, raised the groundwater, and brought the hydrograph back in line with the USGS flows base and subsequent runoff event. Pretty slick deal. I probably should have gone back to the summer unit graph so that's next. And this might be a quick start way to calibrate a new model. 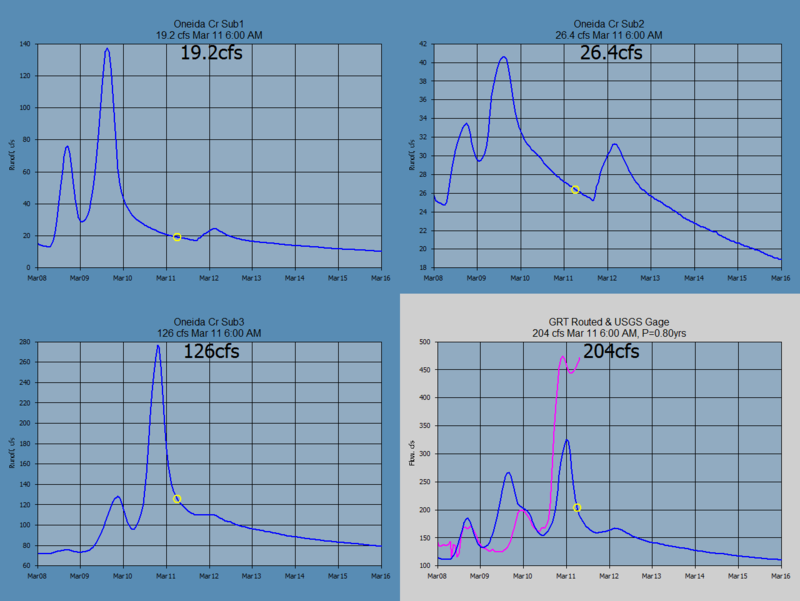 Aug 28, 2015--An 'IF' was added to the GetRealtime_setup.txt to check for very dry base flow and if so then run other runoff setup lines for broader unit graph (Little Tallapoosa) and raise SCS Inital Abstraction from the standard 0.2 to 0.5. Seems to work well. The annual peaks occur throught the year with the lagest peak on June 28 and 2nd was Oct 9.